The Gemini ES-210MXBLU-ST is filled with innovative technology in one complete, lightweight package. 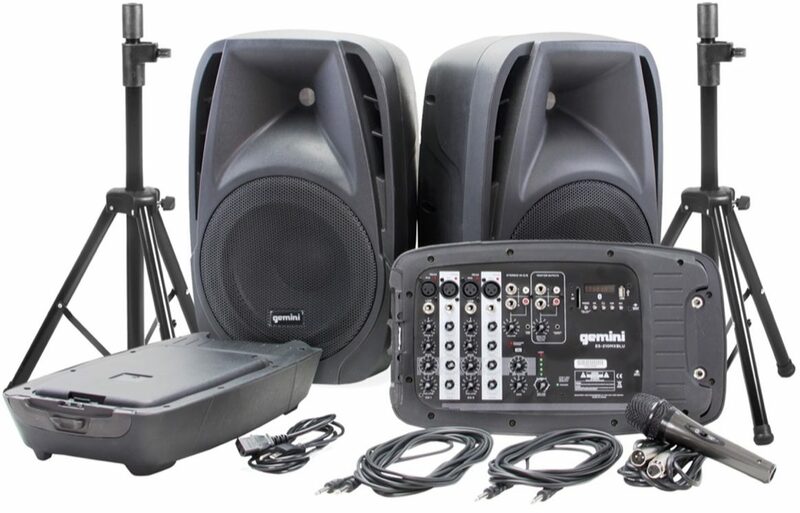 With features including an eight channel mixer, integrated USB, Bluetooth and SD interfaces, and convenient built in storage, it's the perfect solution for those looking for a truly compact, portable PA system. The ES-210MXBLU-ST portable PA system is designed to deliver professional sound without unnecessary bulk. Easily delivering up to 600W of peak power through the two 10-inch passive speakers. This extremely portable system weighing in at only 44 LBS, is perfect for any small to medium sized venue. zZounds is an authorized dealer of Gemini products. Overall: I've already DJ'd at multiple bars with karaoke and I've had positive feedback by patrons stating that the system sounds good. I also purchased LED lights and I'm very impressed for the size of the system. 37 of 40 people (92.5%) found this review helpful. Did you? Overall: I purchased this to run vocals, Keys, and Acoustic guitar thru at small venues. Has enough volume to be heard over the chatter of customers and during breaks has clear crisp audio playback using my mp3 player. Over all great little system for the price.